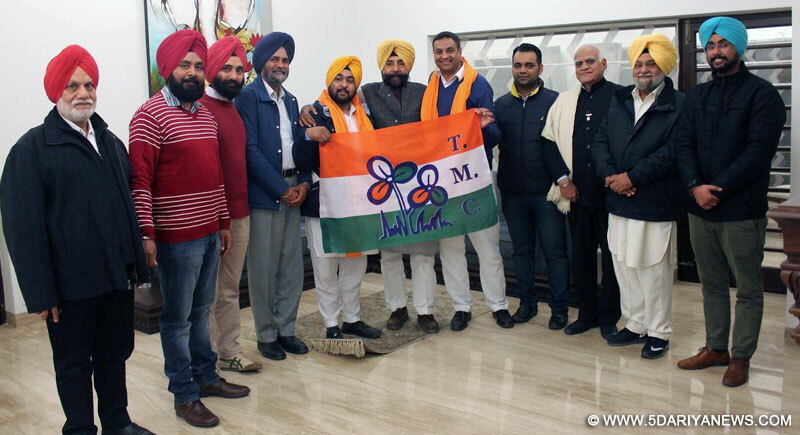 After speculations regarding their exit from AAP were raised following a late night meeting between TMC's Punjab President & Former MP Jagmeet Singh Brar, two senior AAP leaders Jashandeep Sandhu and Baljeet Singh have joined Trinamool Congress earlier today.Jagmeet Singh Brar welcomed Jashandeep and Baljeet into the TMC and said "I am glad that they have placed their trust in the vision of Mamata Banerjee. They will be given their due regard in the party and their opinions will find a free voice in the TMC. Our doors are open to all like-minded brothers & sisters of all parties including AAP and we will continue to work against Rajwadashahi & Parivaarwaad in Punjab, let this joining be seen as a Sangam of common ideals and a joint mission to Save Punjab. "Brar indicated that the TMC was being approached by a large number of dissidents from the Congress as well as a section of the AAP which was upset for various reasons with their leadership and hinted that in the coming days some big names of the Congress and AAP may make the move to TMC.Baljeet Singh was one of the founder members of the AAP and was instrumental in setting up the party in Punjab, he resigned from the position of State Youth Vice President & as In-charge of the Gurdaspur & Pathankot districts. He said "I did not want a party ticket or high offices but when dedicated workers are pushed aside and the ideals and principles we left everything for are compromised then there is no trust left. I raised my concerns to every level of the party leadership but was not given a fair hearing, so instead of going public like others before me I have chosen to move to the TMC to support the movement from outside without hurting what people like me have built with their sweat and blood. "Jashandeep Sandhu is the great-grandson of Shaheed E Azam Bhagat Singh and was Sector In-charge of Fatehgarh Saheb, Bassi Pathana & Amloh and was also actively leading in Banga & Nawanshahr. Sandhu said "I had been associated with the movement from the days of India Against Corruption and gave up my Canadian citizenship to work for the goals of the party, unfortunately today I feel the ideals of the movement are being compromised but I am glad that we have found a platform for issue based politics where we can work & express ourselves freely. "Sandhu was a probable candidate for the Nawanshahr constituency but was overlooked when the late entrant Charanjiit Singh Channi was given the AAP ticket instead. Another member of Shaheed Bhagat Singh's family Gurjit Kaur Dhatt has also been lying low since she was denied the AAP ticket from Tanda. Sandhu also remarked "It is very easy to copy Bhagat Singh's turban and use his name but we have been used and thrown aside in favor of opportunist ticket seekers and more than anything this has broken our bond of trust with AAP"
Bhola Case Systematically Sabotaged By The Punjab Govt.